Everyone knows the Public Broadcasting Service (PBS) for free TV, especially their top-notch kids programming. Many of us grew up watching Sesame Street and Mr. Rogers' Neighborhood. What you may not know (if you aren't a teacher) is that every single PBS show is a potential goldmine for education resources and many series have accompanying lesson plans and interactives. Aside from being a great national media organization, PBS has a long-standing reputation in the education community as a provider of high-quality teaching resources and services. In addition to program-related content, PBS Education offers professional development courses and communities along with independent national services like PBS Kids Island. 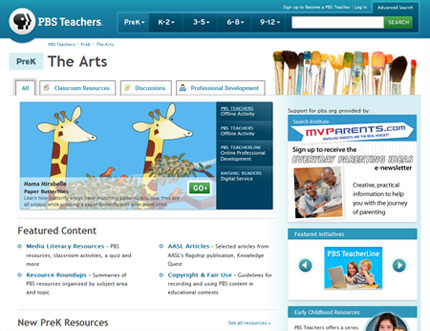 The PBS Teachers web site faces the challenge of helping PreK-12 educators navigate these rich resources - across all PBS program and station sites - to find just what they need for their current lessons or professional development needs. While a primary goal of the redesign was to establish a consistent browsing experience that could scale as new resources and services were added, PBS Teachers also needed a fresh look to fit in with the new PBS brand strategy. Viget had the great privilege of working with the good folks over at PBS Education to tackle this redesign, and we're pleased to announce the launch of the new PBS Teachers site!